Microcontroller applications consist of code running on the microcontroller which controls a variety of peripherals (devices). Some of these are included on the microcontroller chip itself (e.g., UART and I2C bus interfaces), and some are ‘hard wired’ on a development board (most have user-settable LEDs, for example). 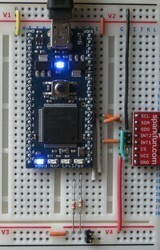 Other devices might be on the board itself or might be attached separately via some serial bus. tollosLED, which provides access to one or more on-board LEDs. These are intended to be useful for basic control of more than one specific device of the same kind, so these generic interface modules also require low-level glue functions, and these are held in device libraries. Tollos function names in device libraries all have the suffix ‘IO’. LIS3LV02.a – for the similar STMicroelectronics device. Hence, if a Tollos application only needs the basic functions provided in the generic interface then it can use either accelerometer device simply by linking with the chosen library. Even if more sophisticated functions are needed, the Tollos functions should allow a quick start with the device which can then be extended as required. Let me know if you see a basic (and widely applicable) function missing from a Tollos generic interface. Note, however, that the purpose of the Tollos generic interfaces is to provide cross-device support, not to try and provide access to every feature of every device. peripheral libraries: ADXL345, DOGXL, and ITG3200.